Dan, from Woodlands.co.uk, met us on site and explained that the management plan favoured planting oak trees so that made it ideal for us. After a few months of paperwork, we received the key to the padlock of the woodland gate just before Christmas. A nicer present could not have been had. 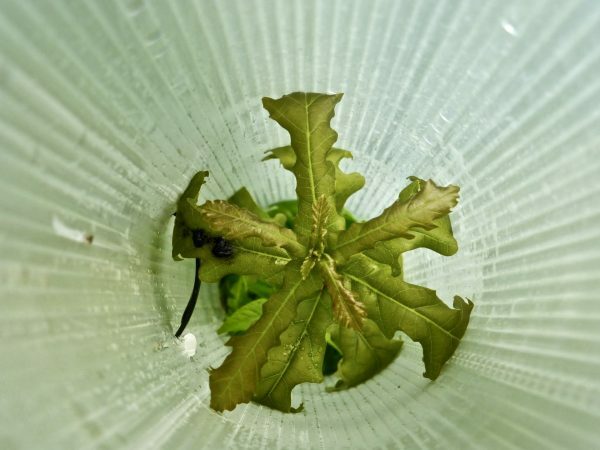 Common advice is not to do anything with your wood for the first year but we had dozens of baby oak trees bursting from their pots looking for a new home. When I say pots, I actually mean seaside buckets. During the summertime we are part of a group who clean up our local beach and it is often left smothered in plastic buckets and spades at the end of a busy day. The plastic is not recyclable so would usually end up in the sea or landfill. We had found a new use for them - planting acorns! We ordered our first batch of growing tubes and stakes and headed up to begin planting. The first twelve we named as the twelve days of Christmas. During this first year we have planted the magic number of forty-two trees. For any fans of ‘Hitchhikers Guide to the Galaxy’ you will appreciate the significance of this number! What has been an unexpected gift is that we have taken friends and family up to the wood to plant a tree with them. We know that oaks can grow for hundreds of years so this shared act has great poignancy for us. Hopefully it will help to offset our years of CO2 emissions from travelling on holidays abroad. 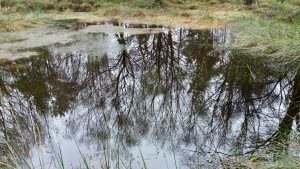 We have enjoyed watching the wood and moorland change through the seasons. 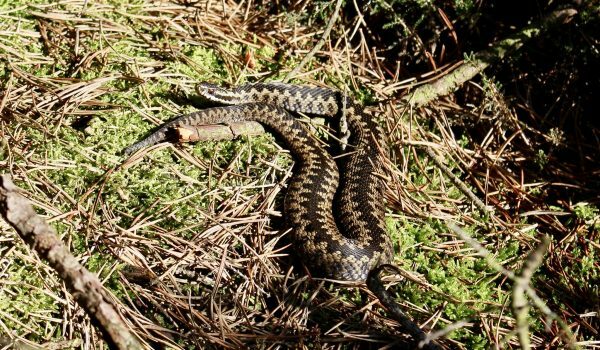 Our first big surprise in spring was to see a beautiful brown adder basking in the sunshine. There have been a few common lizards too. What surprised us and our visitors are the old Scots pine trees that have grown branches from the base outwards in all directions where they are not forced to grow straight up by close planting. These unruly trees look like Medusa and have great character. 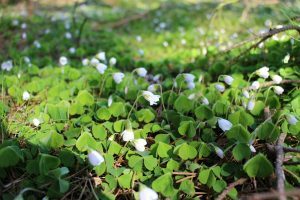 Under one of them bloomed a carpet of white wood anemone in the spring. The first plants to flower were the foxgloves and I noticed that one flowered again at the start of October. Next came the cotton grass which looked amazing with the sun shimmering through their fluffy tops. The trees became alive with birds – finches, blackbirds and a friendly robin. 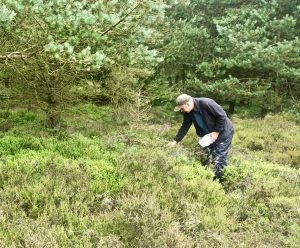 In summer we thinned a few straggling pines and beat back the bracken. Whilst lying down for a rest we found we had upset an ant colony and ended up with bites to show for it. The heather bloomed in glorious purple alongside protective swarms of midges that also left us with bites to remember them by. The bilberries fruited in enormous numbers and we got backache trying to pick them all. One particularly warm day, I took a cool dip in the pond and communed with nature remembering the wonderful descriptive passages in Roger Deakin’s book ‘Waterlog’. And so we return to autumn and the birch leaves are falling like a snow flurry around the pond. Mushrooms of all shapes and colours are popping up. A glistening green-blue dragonfly skims over the dead bracken. Across our open space stand what look like forty-two sentries: green tubes and stakes, with oak trees inside hunkering down for their first winter. It has been a special year and we are fortunate to be able to leave our mark on what may eventually become a revived piece of deciduous woodland. What a delightful description of your first year. May your oaks flourish and you alongside them. We discover new delights in our Pembrokeshire wood every year and have now learned how to recycle plastic beach buckets! A nicely written piece expressing fine sentiments – a man after my own heart. 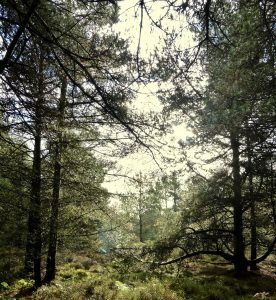 Re A year in our own woodland…sounds lovely. 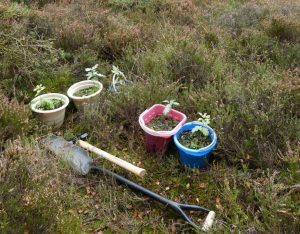 I just wonder whether there are already oaks growing there to indicate suitable conditions, as the plants listed- cotton grass, heather, bilberries, and the presence of reptiles do suggest that the soil is sandy with a low pH (acidic). But brilliant to establish oak woodland- what could be better? UK government’s 25 year plan – what does it mean for our trees and seas?